The symbol of bank security has been the safe. 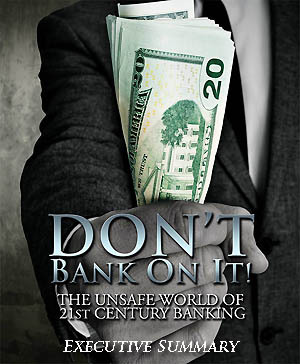 Today it should be the "unsafe" because, as this book reveals, your bank deposits are now in danger in at least 20 major ways – from cybercriminals, money-hungry politicians, Too-Big-To-Fail bankers, and those now stealing your dollars’ value – including the dollars you thought were secure inside bank vaults. Your bank account is systematically being robbed, and is at serious risk of being seized and looted. How much interest is your bank paying you for putting your money at such risk? Less Than Zero Percent! Monetary expert Craig R. Smith and futurist Lowell Ponte show why it has become illogical, and hazardous to your wealth, to trust your money to today's increasingly vulnerable and unsafe banks. Banks (as we know them) and the U.S. Dollar are dying as we are pulled into the rising "cashless society" where everything, from your digital "money" to your household appliances, will be Internet-controllable and hackable, as well as trackable and taxable by bloated governments desperate for ever-more revenue. Smith and Ponte propose a surprising alternative future you can bank on, based in part on what a Harvard economics professor did with his own near-million-dollar bank account. This book shows ways to save your savings. Register or call 800-289-2646 for a free Executive Summary of the book!